Fort Carson, Colorado, is the Army installation known as “The Mountain Post”. Located in the Colorado Springs area, this fort is one of several important military bases and operations in the region including Peterson Air Force Base, NORAD, and the U.S. Air Force Academy. Fort Carson was built during World War Two, making it one of the youngest Army operations in the United States. 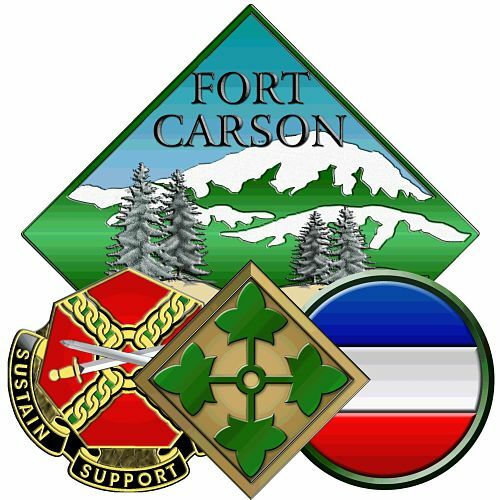 Find information about Fort Carson, Colorado, including the main commercial and DSN numbers for the base, information on basic services, base transportation, lodging for TDY and PSCing personnel, and inprocessing. Fort Carson hosts a variety of missions and units; training, deployments, and support of deployment operations are just a few of the areas troops here are known for. The installation is the home of the 4th Infantry Division, the 10th Special Forces Group, the 71st Ordnance Group and much more; it also hosts units of the U.S. Army Reserve, Navy Reserve and the Colorado Army National Guard. There is a diverse group of missions and training at Fort Carson, all of which is designed to support operations in places such as Afghanistan, Iraq, and elsewhere. Fort Carson, named after Army General Kit Carson, was commissioned during World War Two as Camp Carson following the attack on Pearl Harbor. The Army’s 89th Infantry Division was the first major unit activated 100,000 soldiers received training at Camp Carson before taking part in the war effort. A total of 125 units were activated at Camp Carson; approximately 100 more were transferred there. Camp Carson housed approximately 9,000 Axis prisoners of war starting in 1943. In 1950, the operation was redesignated Fort Carson, and training operations increased there so much that by the early 1980s it was necessary to expand the post to more than 137,000 acres. In 1999, Fort Carson became the home of the first Active Component-Reserve Component Division in the U.S. Army thanks to the reactivation of the Army’s 7th Infantry Division. But about seven years later, 7th ID was inactivated and Division West, First Army, took its’ place. The training and deployment missions at the installation include support of global anti-terror operations. Since 2003, most Fort Carson units have been deployed in support of these missions. Fort Carson is also on the cutting edge of some of the Department of Defense’s “green” initiatives; in 2011, Fort Carson was named an Army “Net Zero” installation with a goal of having zero waste by 2020 (among other goals). Today, Fort Carson’s mission is focused on training, deployments, and sustainment of “brigade units of action”, getting troops ready for missions around the globe. In 2016 the Mountain Post Soldier Center opened at Fort Carson, centralizing most services needed for deployment, inprocessing, Soldier Readiness Processing, finance and much more. Fort Carson is ideally located for outdoors activities including hiking, camping, fishing, and sightseeing. One of the most popular attractions in the Fort Carson area adjacent to Colorado Springs is The Garden Of The Gods, a registered National Landmark that features bike trails, rock climbing, jeep tours and much more. Nearby is the Will Rogers Shrine Of The Sun, the Cheyenne Mountain area which is also home to NORAD, and there are plenty of local operations that feature zipline events and even hot air balloon tours. Sports fans will love the World Arena which features live sports, performances, and other entertainment. History buffs should check out the Colorado Springs National Museum of World War II Aviation, the Petersen Air And Space Museum, plus the Colorado Springs Pioneers Museum. This area is known for its’ microbreweries and taprooms including the Colorado Mountain Brewery at the Roundhouse, Bristol Brewing Company and Cerberus Brewing Company. Tours may be available for these facilities depending on the season. All check-ins during duty hours must be in uniform; after 3PM the uniform requirement is waived. Those taking permissive TDY for house hunting in conjunction with military leave prior to starting duty at Fort Carson must report to the Housing Office located in building 1225, to have leave forms stamped. Without this stamp, permissive TDY cannot be utilized and ten days of personal leave will be charged to the service member instead. Those in need of an extension of leave should call the Replacement Detachment at (719) 526-6961 or 524-4475. Those stationed at Fort Carson have the option to be treated at military hospitals located at Fort Carson or at the U.S. Air Force Academy, which is also in the area. On-post, Evans Army Community Hospital features a five-story main hospital, plus a clinic with approximately 400 treatment rooms. In most cases, making appointments at Evens is done via TriWest Healthcare Alliance; for appointments call 719-264-5000. Emergency services are available; the number is 719-526-7111. Emergency services are provided based on medical priority rather than order of arrival. Medical services on Fort Carson include a variety of satellite clinics and specialty programs not co-located in the main Evans facility. Deployment processing, behavioral health, preventive medicine, and a variety of other services may be available at separate locations from the main family care center/hospital facilities. On-post child care services are handled by Child Development Centers; there are six centers on Fort Carson offering daily and hourly childcare for children six weeks to five years old. Hours, schedules, and other details will vary depending on location. There are waiting lists for some of the Fort Carson CDCs, call 719-526-1100/1101 for more information. Fort Carson also features on-post daycare options in private homes; Family Child Care programs are small group operations based out of family housing units that have been certified and inspected. Call 719-526-3338 to learn more about Family Child Care options on post. All personnel who need ID card services at Fort Carson are directed to make online appointments via the RAPIDS system. The Fort Carson ID Card and DEERS Facility accepts one appointment per family, which must be scheduled at least 24 hours prior. Call 719-524-3704 to update or discuss your appointment. All ID card renewals, replacement, or new issue will require proper ID including a current state-issued photo ID. Walk-in services may not be available depending on demand, mission requirements, and other factors. All personnel coming to Fort Carson on PCS orders are directed to track and manage their household goods shipments via the The Defense Personal Property System at Move.mil. You can also contact the Fort Carson Inbound Household Goods and Transportation Office at t (719) 526-3755. There are no DoD schools at Fort Carson, but there are elementary schools and a middle school on-post, operated by Fountain-Fort Carson School District 8. High school students living on post are bussed offsite to Fountain-Fort Carson High School. Those living off base will attend, depending on the location of the home, one of over 150 schools in the local area run by 10 school districts. All new students must have state-required immunizations (DPT, polio, measles, rubella and mumps), provide copies of their birth certificate, previous school transcripts, and proof of residency in the State of Colorado. Physicals are not required for enrollment, but local schools may require a physical for intramural sports and other activities. Call School Liaison Services at 719-526-1101 for more information. Family housing at Fort Carson is privatized and run by Balfour Beatty Communities. On-base housing is available for all ranks; base housing is assigned by Fort Carson Family Housing leasing operations. A waiting list is not uncommon depending on the time of year, PCS/TDY season, and other variables. All personnel should fill out a housing application at the Fort Carson Housing website and contact the management office once the application has been submitted. Contact them at 719-579-1606, Ext. 250. Housing for unaccompanied service members is coordinated at the Single Soldier Housing Office (SSH), located in Building 7301, Room 103. Call 719-526-0570 or 719-524-0851. Unaccompanied E-5s and below, dual military members with a spouse assigned to a different duty station and without dependent family members, and those who are by regulation are not entitled to collect the Basic Allowance For Housing are assigned a room on post in the barracks. Permanent Party Bachelor Officer and Bachelor SSG-CSM quarters are not available on post. Dual military families with both spouses assigned to Ft Carson must contact the Fort Carson UPH Specialist, Located in Building 7301, Room 103, 719-526-0570 to obtain a Certificate of Non-availability (CNA) to reside on/off post. All personnel are directed not to enter into a legally binding rental or lease agreement until getting a CNA. Those at Fort Carson on PCS or TDY orders are served by InterContinental Hotels Group (IHG) Army Hotels. Reservations are permitted up to 60 days in advance with priority given to those traveling on military orders. Call to make reservations at (719) 526-4832 or 1-877-711-8326. Unaccompanied service members SSgt and below are assigned temporary billets by the Fort Carson Replacement Detachment. Fort Carson features a shuttle bus to various destinations on post. This on-post shuttle operates three bus lines running seven days a week. Like public transportation off-post, rides are first-come, first served and on a space available basis. Shuttle schedules are posted on the official Fort Carson Shuttle Facebook page. All privately owned vehicles must be registered on post at Building 6012 located by Gate 1. Drivers will need a current license, valid (not expired) vehicle registration), military ID, and proof of minimum insurance. All vehicles entering Fort Carson are subject to search and random inspections are common. All drivers must carry proof of all state-required insurance. All motorcycle operators are required to attend an on-base safety briefing before operating their vehicles on Fort Carson. The State of Colorado does not require helmets, but all personnel assigned to Fort Carson riding motorcycles are required to use a helmet on and off-post. Speed limits on post are 10 MPH when passing troops, 20 MPH in housing areas, and 30 MPH in all other areas unless otherwise posted. Vehicle registration laws in Colorado include the ability for military members to file a non-resident form (these forms can be obtained from the Staff Judge Advocate). The non-resident form indicates that the military member is not a Colorado resident, which exempts the vehicle owner from paying state taxes on that vehicle.